“It’s time to be gentle guys,” intoned Marla Spivak as the 7 members of my group from the class of 30 filed into the darkened lab room. We were about to learn how to graft one-day old larvae under the watchful eyes of Marla and Judy Wu, a PhD candidate studying the effects of neonicotinoids. Marla Spivak explains hygienic behavior. This was July 7, 2012 the morning of day two of the two-and-a-half day Queen Rearing Short Course taught by Marla Spivak at the St. Paul campus of the University of Minnesota. We were doing dry runs of grafting and hive manipulations in preparation for the real thing that afternoon. Marla and Judy taught us how to use a grafting tool, and we practiced moving tiny larva from the cells of a frame of eggs and larva to the plastic grafting cups. Our work was then scrutinized under a highly magnified lens that projected onto a computer screen. My first grafts were not good. In most cases I had only moved royal jelly. That morning our 4 groups of 7 or 8 moved among stations where we practiced preparing a “swarm box” to start the queen cells, a finishing hive to grow the queen cells, and grafting. The practice session was in the classroom, using dummy hives. That afternoon, we would repeat the activities with live bees in the field. Marla Spivak is an acclaimed entomology professor best known for developing the Minnesota hygienic line of bees. In 2010 she was awarded a MacArthur Foundation “genius grant” for her work developing a Varroa mite and disease resistant strain of honey bees. In addition to her research, Spivak leads the university’s Bee Lab, which provides research and education to professional and amateur beekeepers. The university’s bee research and outreach program, which has been operating since 1918, is the only one of its kind in the Upper Midwest, the top honey-producing region in the United States. The Bee Lab conducts several courses for the public including the Queen Rearing Short Course I was attending. The primary goal of the course is to teach northern beekeepers methods of rearing their own queens so they have their own sources of queens rather than relying on southern bee breeders. The main concern is the importation of Africanized bees to the North. Due to demand, one must apply to be accepted into the course. I completed the online application in March and, much to my surprise, was informed in June that I had been accepted. Among the other students were hobbyists, sideliners and two commercial beekeepers. Most came from the Midwest, although three of us were from the Northeast. Students check the results of their grafts. The course teaches the Doolittle method of queen rearing. While acknowledging that there are many other methods, Marla and her assistant Gary Reuter consider the Doolittle method to be the most reliable and teachable. They are experienced and effective teachers. Marla is a warm, approachable woman. Gary is clearly the mechanic of the team and is also a very funny man. He is an inventor and tinkerer who made many of the innovative gadgets used in the Bee Lab. I highly recommend his website [tc.umn.edu/~reute001]. Marla and Gary were assisted by five graduate students. The students briefly explained to us their studies, which included Judy’s neonicotinoid work, the immune benefits of propolis and the physiological effects of Nosema ceranae. On the afternoon of day two, the class gathered at one of the two bee yards hosted by the St. Paul campus. We were told to bring protective gear. I smugly noted as I arrived at the bee yard that only I and the two commercial keepers weren’t suited; we each only brought veils. While I didn’t regret that decision, I did question it as I entered the bee yard containing about 40 tightly spaced hives. It was a beautiful sunny day and bees were flying everywhere. In the field, we applied the practice from that morning. We grafted in the honey house from frames of one-day-old larvae. We were given frames prepared by the graduate students. Four days earlier they had placed the queen inside a confinement cage on a frame of drawn comb. That way, they could be certain that the larvae were no older than 4 days. The larvae of course are found in the bottom of cells and are so tiny that I could only see them with a strong magnifying glass. And, as Marla said, you have to be really gentle in picking them up with the grafting tool and placing them in the bottom of the queen cups. An otherwise successful graft can be ruined if you put the larva on the side of the cup. The practice sessions had helped. My grafts were better than in the morning. Once we finished our eight grafts, we put them on cell bars and transferred them to the swarm boxes we had prepared upon arrival to the yard. A swarm box is essentially a 5-frame deep nuc with an extended bottom that can hold a wet sponge for providing humidity and drinking water. Into this box you shake 4 – 5 pounds of nurse bees and add 2 – 3 frames of honey and pollen, being careful not to add any open brood. The swarm box is closed up and placed in a dark room for 24 hours. We also prepared finishing hives into which we would transfer the cell bars the next day. While I won’t go into the details of setting up a finishing hive since there are many resources for that information, suffice it to say that it took significant manipulation. The instructors wanted us to have live experience, so we had to move around many frames from box to box, and isolate the queen below an excluder. The process was complicated by the fact that we were in groups of 7 or 8. We eventually sorted it out, but frankly, it would have easier to do on one’s own. While we were in the field, Marla and the researchers devoted time to showing us other interesting things. As shown in the pictures at right, Marla demonstrated how to test for hygienic behavior. As part of the research work she did to develop the Minnesota hygienic queens, she had to select for hygienic behavior. The method of testing is to place a PVC tube over a section of capped brood and pour liquid nitrogen into the tube to kill that brood. One of her research fellows dragged out a big urn of nitrogen, poured some into a beaker and then poured that into the tube. The brood was killed instantly. The frame was then placed back into the hive and inspected the next day. If the bees had cleaned out 90% or more of the dead brood, the stock passed the hygienic test. When we returned the next day and checked, almost all of the dead brood was gone. Marla also showed how to mark queens. She pulled out a frame of bees and asked us each to pick up a drone for practice. There were no drones on the frame. Instead, she suggested we try marking workers, on the theory that if you can mark a worker without getting stung, you can probably mark a queen. I tried. I got stung. glass walls of each hive. It was easy to see that the queen’s activity was directly affected by the pesticide. The higher the concentration, the less she moved. It was fascinating. Once our field work was finished, we had to wait to see the results of our grafts. We re-gathered in the bee yard the next morning for the moment of truth. Each group went to its swarm box and removed the cell bars which we had marked with our initials. We looked for the beginnings of queen cells on the edges of the plastic cups that would indicate that the bees had accepted the grafts. People called out numbers. “I got 3!” “I have 6!” “I got all 8!” My number? 4. While not what I had hoped for, that wasn’t bad considering my difficulty in the practice session. I was pleased. And I learned how to raise queens. I haven’t yet employed that knowledge, but I plan to begin to raise my own queens next spring. It is one of my strategies in creating a self-sustaining apiary. What I hope to do is raise and bank a few queens (no more than 8 or 10 at a time) to ensure that I have them to make splits and in case of emergencies. I also learned that queen rearing is not easy. 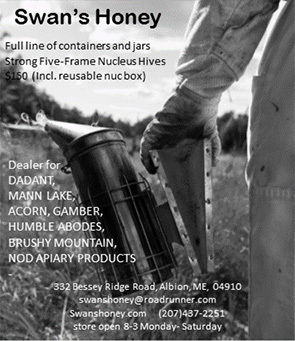 It requires a great deal of care in record keeping, stock selection and hive maintenance. Moreover, while it is best to breed from your best colonies, you have to take care to avoid inbreeding by not using the same breeder colonies each year. And in a small operation like mine, you can’t control drone stock, thus your best efforts to find good stock can easily be diluted by poor drones. With all that said, I am going to plow ahead. I will update you on my progress next year.